Is it possible to support advancements in intelligent systems from a compassionate point of view? Perhaps by leveling the playing field with intelligence, we might tackle one of the most bitterly contested characteristics of man. We face ‘intelligence battles’ on a daily basis – in classrooms, social settings, and in the office. Much of our status in society is based upon intelligence. What if everyone had a memory booster, something like a personal hard drive? Many of today’s geniuses have impeccable memories. What if everyone accesses the same reservoir of ‘facts and information’ from intelligent systems? (Currently access to primary sources of knowledge is costly, which creates an advantage for those who can afford it.) Could there be a baseline IQ because of boosts in cognitive thinking? There are smart people. With universal access to AI, smart people represent a larger segment of the population. The bell curve for IQ becomes taller and standard deviations smaller. More smart people follow their passions and interests, rather than being excluded because of their natural intelligence. In addition, smart people without access to a proper education use AI to catch up. Finally, there are people who have less natural intelligence but have a more satisfying life because of AI. Soft skills, character and personality become paramount in employment decisions. We are starting to see this now. Many of the leadership coaches say emotional intelligence (EQ) often has more value than cognitive intelligence (IQ). It will be interesting to see if those who have access to intelligent systems share them with the general public. Naturally intelligent people lose an advantage – something that gives them power. Having a high IQ, SAT, GMAT, GRE, or LSAT – all tests largely driven by raw intelligence – practically guarantees access to a top college and future employment. 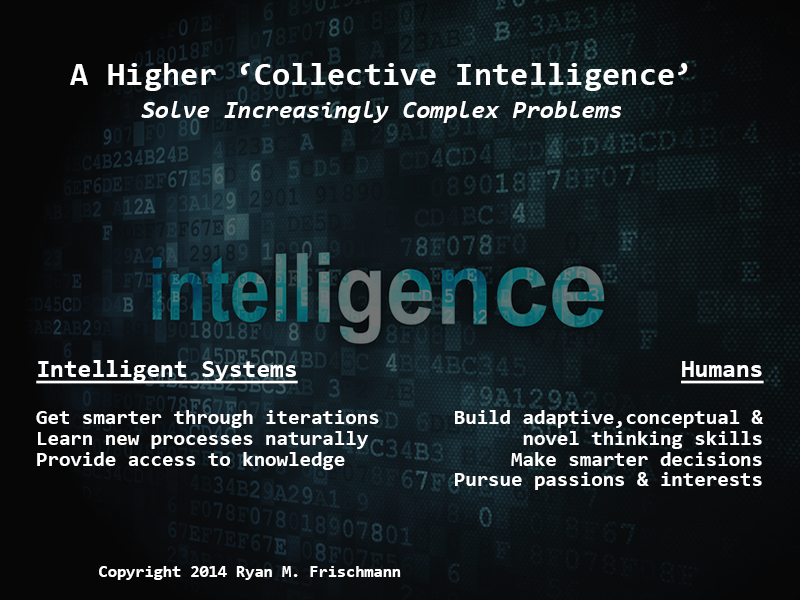 Barring geniuses, intelligence in the future will be measured by adaptive, conceptual and novel thinking skills. Now we come up with a relevant question and it is something to ponder over a period of time; but in the future, we get an immediate response from an intelligent system. So we ask a series of questions, modifying each question based on previous responses. In addition to being responsive, creative ‘out of the box’ thinking becomes a highly sought after skill. Pulls together content from a multitude of sources and puts into a ranked list based on relevancy. Intelligent systems tap into a vast amount of online information. Cross-disciplines and subject areas to solve increasingly complex problems. An intelligent system synthesizes information from many disciplines. Processes all types of content: website, documents, narratives, graphics, and videos. Intelligent systems already have image and video recognition; it only gets more advanced. Allows intuition to be validated by sources immediately. Smart people come up with ideas without doing the necessary research, an intelligent system does it for them. Taps into the Internet of Things. Intelligent systems access into the growing number of sensors to understand behaviors, and add context to experiences. Yesterday, IBM unveiled the enterprise email system Verse to the world. What separates Verse from its predecessors, according to a press release, is how it learns employees’ preferences and then provides “instant context about a given project as well as the people and teams collaborating on it”. And an intriguing ‘future option’ allows users to “query Watson on a given topic and receive a direct reply with answers ranked by degree of confidence.”[ii] If your company invests in Verse, you might have access to the smartest supercomputer on the planet. Identify companies based on financials. Create a complex query string in Moodys. Transfer the results into Excel. Complete multiple iterations of this process to get a final list of companies. Hears criteria through a verbal command. Works across platforms and understands idiosyncrasies between iterations. Outputs results in Excel in minutes. Sort them based on relevancy (a time-consuming process). Reads and processes the documents, then makes recommendations (in minutes). Input comparable companies’ financial numbers into Excel, calculate ratios. Each time the intelligent system goes through the process it gets better. It does it faster. It understands and remembers why you make decisions to keep or drop comparable companies. Eventually, the intelligent system does everything based on the initial criteria and produces results in minutes.